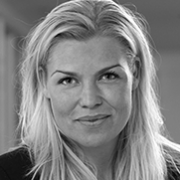 Rikke works as a Business Director EMEA for the Dentsu Aegis Network in Nordics, Central & Eastern Europe. In this role she oversees all areas of marketing, including business development, new business, prospecting, communications & reputation management of Dentsu Aegis Network brands and wider business. She leads business development on Dentsu Aegis' regional Top 20 clients as well as new business and major international pitches. She regularly speaks at relevant conferences to raise the profile of the region's Dentsu Aegis CEOs and thought leaders within Dentsu Aegis Network. Prior to this role, Rikke was Communications & Fuse Director for Omnicon Media Group Nordics in Copenhagen. Preceding this, she has worked previously as a Communication Planning Manager. She was awarded with the Ole Stig Scholarship, Cannes Media Lions shortlist Young Adults and at Rambuk: Winner of Best Use of Media and MEC Global Ideas. Rikke Grundtvig has a BA and a MA Degree in Rhetoric from the University of Copenhagen. She lives and works in Copenhagen.